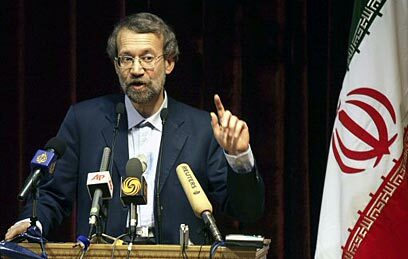 Iran's chief nuclear envoy Ali Larijani said on Friday that Iran is committed to the peaceful use of nuclear technology but warned the situation could change if his country is threatened. "We oppose obtaining nuclear weapons and we will peacefully use nuclear technology under the framework of the Nonproliferation Treaty, but if we are threatened, the situation may change," He told a news conference after two days of talks in Beijing. Iran's nuclear chief said his country has produced and stored 250 tons of the gas used as the feedstock for uranium enrichment, state-run television reported Friday. Vice President Gholamreza Aghazadeh, who is also the head of the Atomic Energy Organization of Iran, said Iran has kept the uranium hexaflouride gas, or UF-6, in underground tunnels at a nuclear facility in Isfahan to protect it from any possible attack. "Today, we have produced more than 250 tons of UF-6. Should you visit Isfahan, you will see we have constructed tunnels that are almost unique in the world," State-run television quoted Aghazadeh as saying. While China has strong trade ties with oil-rich Iran, it is a permanent member of the UN Security Council, which voted unanimously to bar all countries from selling materials and technology to Iran that could contribute to its nuclear and missile programs. It also froze the assets of 10 Iranian companies and 12 individuals related to those programs. Iranian President Mahmoud Ahmadinejad on Friday said international sanctions won't stop Iran from enriching uranium, vowing not to give into "Coercion," State-run television reported. "Iran will stand up to coercion. ... All Iranians stand united to defend their nuclear rights," State-run TV quoted Ahmadinejad as saying. Iran has refused to comply with international demands that it suspend uranium enrichment. It also has condemned as "Invalid" And "Illegal" a UN Security Council resolution passed last month that imposes sanctions against the Islamic Republic for refusing to halt enrichment. "Enemies have assumed that they can prevent the progress of the Iranian nation through psychological war and issuing resolutions, but they will be defeated," Ahmadinejad was quoted as saying on state-run TV. See all talkbacks "Iranian official: If threatened, we will use nuclear weapons"